Sigh. I’ve been un-knitting this morning for almost twice as long as I knit. And I know better. Is it Friday yet? 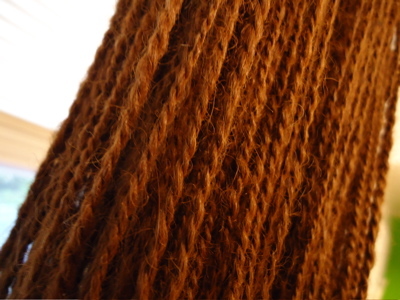 I am so impatient when it comes to handspun yarn. I hang it in the kitchen, on a hook over the sink that I imagine was intended for a planter, and I touch it every time I walk by. Which is a lot. Dry faster! I want to skein you up and admire you! Alas, the alpaca is still quite damp, but even now, I am starting to get a sense for the finished yarn, and I’m quite happy with the angle of the twist in the ply. It is still hard to tell exactly how soft this is going to be, but it feels lofty. Monday is my busy, all-day-on-campus day this semester, so maybe by the time I get home this evening, the alpaca will be dry. I am also waiting for the coffee to be ready. (Or I was, when I took the picture. I’m now enjoying the first few sips from my mug.) Oh, Monday. It was hard to get up this morning, and I’m nowhere near full alertness. I’m mostly through my first cup of coffee (and will need a second). Boh has already given up, and is currently mid-snore. I started plying the AVFKW targhee in hibiscus yesterday, and I’m hoping to finish this today so that I can get ready to do some sampling for my first sweater-spinning project! 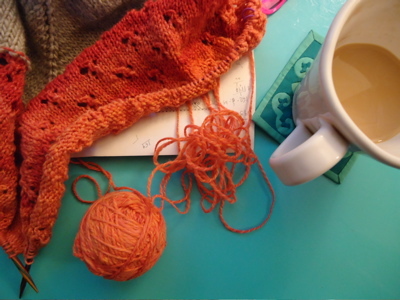 I snapped this picture while waiting for my french press to finish working its magic — seems I stopped knitting mid-row last night because I just had to get into bed. The colors are way off in this picture, as the shawl is resting on the arm of the couch underneath a very bright lamp, but I liked how it looked as I stumbled kitchenward to put water on for coffee this morning. Things were a bit rushed yesterday, so I didn’t take any pictures of my farm share, but since I’ve been documenting my weekly haul here, I picked 4 quarts of raspberries and a quart of blackberries in the fields, and then picked up lettuce, a few pounds of heirloom yellow and purple carrots, cauliflower, hot peppers, red peppers, italian eggplant, bok choi, basil, and the last red tomato of the season. Do you have those days that seem to take forever to progress? Yesterday was that kind of day. I tried to fill the hours, but the time refused to pass. All of that changed just before evening, when I ran into a friend on the street, finally started another book, met friends from out of town for a great dinner, relaxed with the dog, and (wait for it) chased our friend, the bat, out of my apartment with a broom around midnight. 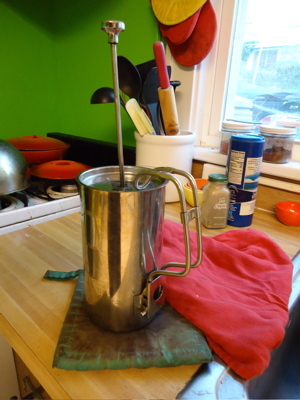 An incredible lightning storm and the ruminations of my brain kept me up quite late last night, so the morning’s cup of coffee must again feature prominently in today’s post. 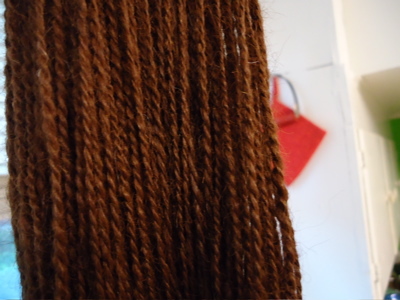 I finished spinning and plying the AVFKW falklands fiber in the silent undergrowth colorway, but I couldn’t capture the depth of the browns and greens with yesterday’s overcast sky (even with the change of background.) The skein is still hanging to dry — I’ll try again tomorrow. pieces of a sunday morning. My morning ritual, the first falklands bobbin, starting a second toe, the aging sunflowers with their pile of pollen: pieces of a Sunday morning.